Centrally located between Candolim and Baga, Calangute is one of the most popular beach resorts in Goa attracting both domestic and international tourists alike. This bustling resort can become especially busy at the weekends when Indian families come to enjoy the sand and sunshine. 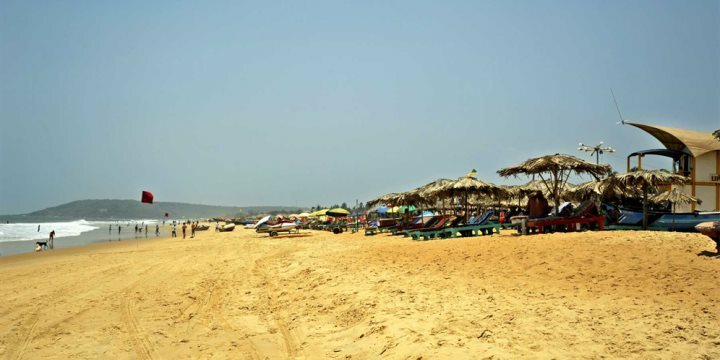 Calangute beach is certainly one of the star attractions - a long stretch of golden sand lined with colourful wooden beach shacks and backed by towering coconut palms. Water sports at Calangute beach are also aplenty, including parasailing and jet skis, while colourful boats line the sands and add a vibrant and attractive personality to the beach. Inland from the beach, the hustle and bustle continues through Calangute’s narrow streets. The resort offers a wide range of amenities for tourists including banks, foreign exchange offices and supermarkets as well as a wide variety of bars and restaurants. If you’re looking for a little culture when visiting Calangute, take a visit to St. Alex Church. Here you can admire this beautiful white building and explore the lavish interior of the church, which was rebuilt for the third time in 1741. Please find below a selection of our accommodation in the resort of Calangute in North Goa.